Belly Dancing: Dance Styles Used In The U.S. Here in Part 2, I'm providing more detail on each of these three styles, explaining how the use of solo dancing versus troupe dancing and the structure of the dance vary between the styles. In Part 3, I'll discuss the music, the costuming, and other elements. Troupe dancing is very popular in the United States. Teachers offer their students a troupe experience as a performance outlet. Students who don't yet feel ready to perform solos may find that troupe dancing offers safety in numbers. People band together to explore a shared artistic vision. Many dancers are attracted by the sense of community and feeling of belonging that troupe membership can offer. Often, the friendships made through troupe work can endure for years, even after the troupe dissolves. American Restaurant: Troupe Or Solo? American Restaurant can be done either as a solo performance or as a troupe show. Restaurants, nightclubs, and singing telegram companies are most likely to book solo acts, but troupes frequently perform at community festivals, nursing homes, belly dance events, hospitals, and other such venues. Of course, belly dance events offer another troupe performance outlet. Troupes often use the same types of props as solo dancers. When done as a troupe performance, American Restaurant style usually does not attempt to adhere to the format of the 7-part routine described below. Instead, a series of songs are assembled by a troupe director in whatever order will work best for accommodating smooth transitions from one song to another, costume changes, introduction/disposal of props, etc. U.S. Tribal: Troupe Or Solo? U.S. Tribal is usually done as a troupe rather than a solo. Many Tribal style dancers believe you need to have a tribe, a group of people dancing together, in order to be Tribal. It wasn't always this way. The original Bal Anat troupe presentation consisted of soloists and small groups taking turn coming forward to dance within the context of a troupe performance. Before the rise of FatChanceBellyDance, it was common to see soloists in the style inspired by Bal Anat performing at belly dance events. But the FatChance philosophy relied upon a group being on stage together, and through their marketing, their format rapidly became more popular than the legacy Bal Anat approach. Today, the American Tribal Style variant of Tribal still requires a group. Some Tribal dancers do perform as soloists. 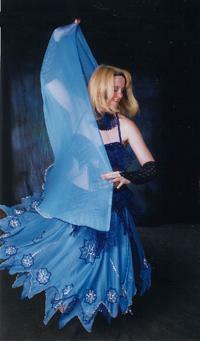 On her first tour with Bellydance Superstars, Rachel Brice initially performed as a soloist. Later, as the tour progressed, the belly dance community questioned the use of a soloist to represent the Tribal style and two additional dancers were recruited to serve as her "tribe". Egyptian Oriental: Troupe Or Solo? Egyptian Oriental style, by its very nature, is a solo dance. People frequently refer to "raqs sharqi" as the "women's solo dance", to distinguish it from traditional folk dances such as the hagallah which are group dances. Some of the old black-and-white movies might show stars such as Samia Gamal accompanied by groups of supporting dancers behind them, and even today a soloist might hire some "supporting dancers" to add energy to her show or hold audience attention during her costume changes. But even these situations generally have a clearly identifiable soloist who stands out against the background dancers, and today they're the exception, not the rule. In Egypt, nearly all group dances consist of folkloric-based styles. Although I have seen group Oriental choreography in Cairo performed as a warm-up act before the star soloist takes the stage, it's not common. Therefore, American dancers who wish to emulate the Egyptian Oriental style as closely as possible usually dance as soloists. Soloists performing American Restaurant style may use either choreography or improvisation. Dancers lucky enough to perform with a live band will usually improvise because it's too difficult to predict exactly how a band will interpret a particular piece of music. Certain environments such as restaurants and birthday parties require an ability to deal with the unexpected, so improvisation is usually the preferred approach in these settings. Troupes performing in American Restaurant style will usually use choreography to facilitate dancing together as a group, and many dance teachers enjoy exploring the creative options in formations, floor patterns, and roll-offs presented by creating choreography for a group of people. Occasionally, pieces in a show may provide an opportunity for a "gang solo" in which each dancer does her own thing, or a piece may be used as a series of mini-solos in which each dancer takes a turn coming forward to dance for 4-8 measures. These are not the usual troupe format, but they do exist. I have seen many troupe performances which are based primarily on choreography but incorporate a small amount of such improvisation. Soloist Tribal dancers may use either choreography or improvisation, depending on their preferences. As with American Restaurant dancers, their decision to improvise may be driven by use of a live band or performing in an unpredictable environment. One major characteristic that differentiates the Tribal variant known as American Tribal Style from all other forms of belly dance, including other Tribal forms, is the group improvisation done by ATS dancers. In this style, one person serves as the leader, with the other group members arranged in a formation that allows them to see her/him. The leader selects from a list of moves known to the group as a whole and uses them in an improvised dance, and the others match what she is doing. The leader uses subtle cues to indicate key transitions to the group. Examples of such cues could be a small hand gesture, a turn of the head, or a shift in body angle. Troupes with a large number of members may arrange a small number of experienced dancers in a small group in the front, doing the more complex improvisational combinations, with the remaining dancers arranged in a second group behind to serve as a chorus line doing simpler moves that complement those being done by the main group. Dance troupes of tribal types other than ATS frequently use choreography instead of group improviation to achieve their unified look. Even for solo dancing, the complexity of classical Egyptian music with its frequent rhythm shifts makes it advisable to use choreography to interpret the many layers and subtleties. This is especially appropriate when dancing to a song that the performer is inexperienced in using. Even top professionals in Egypt regularly use choreography rather than improvisation for their shows. Some dancers will choreograph the primary melody sections, but leave the improvised solo instrumental segments unstructured for spontaneous dancing. Fast or medium entrance: Delilah calls this a "dance of greeting" because the dancer is greeting the audience. Much of the dancer's costume is covered by her veil, which is artfully tucked in around her. Typically the dancer uses the opening music to enter from offstage, and parades around a bit to establish her space before settling into the business of dancing. Slow, flowing rhumba music: The dancer removes her veil and uses it as a frame for her dance. At the end of the song, she discards it. Fast or medium-speed song to pick up the energy level. The dancer does normal fast-music moves. Floor work, standing undulations, or sword/tray balancing: This uses slow, sinuous music, usually either slow chiftitelli or free-form rhythm with an instrumental taqsim. The dancer's decision of which approach (floor work, undulations, or balancing) to use depends partly on the environment, partly on what she enjoys doing, and partly on the policies of the place where she is dancing. For example, dancers usually do floor work only if there is a raised stage that will allow everyone in the audience to see them. Fast or medium piece to pick up the pace: If the dancer is likely to go out looking for tips from the audience, this is usually the time she does it. Finale: This is usually fairly short (under 2 minutes). The dancer acknowledges the audience, acknowledges the band, spins once or twice around stage, and ends her dance. This could be a 9/8 rhythm if the band and the dancer are so inclined, or it could just be a fast 4/4. Today, the most common format tends to consist of 3 parts (entrance, one of the slow pieces, finale) for a short show or 5 parts (picking 5 components from the above list) for a longer show. Different forms of Tribal use different structures for their shows. Soloists following the Bal Anat sort of show format drawing inspiration from modified folkloric formats will frequently follow a style similar to the American Restaurant format. This is because both American Restaurant and the Bal Anat format arose from the same common origin, before they diverged into different directions. This format of alternating between fast and slow music varies the energy level, which helps hold the attention of audiences. One way to vary energy level can be to have differing number of dancers on stage at once - first an entire ensemble of many people, then a soloist, then a small group, perhaps another soloist, etc. This approach could allow a couple of songs of similar speed or style to appear back-to-back while still holding audience interest. Some groups use their show to tell a story, such as portraying themselves as a traveling band of entertainers or enacting a village scene such as a wedding. The story allows them to hold audience interest. The "band of traveling entertainers" theme has been used by the group Hahbi 'Ru. Some groups might outfit pairs or trios each in differing folkloric costumes. For example, one group might be clad in Moroccan d'finas, another in Tunisian costuming with jugs, a third in Egyptian Saidi garb. Each group might take turns coming forward doing a dance appropriate to the characters they portray. This format was used by the original Bal Anat and has been used by its new incarnation under the direction of Suhaila Salimpour. In the American Tribal Style approach to dancing, the structure still tends to alternate between fast and slow songs. ATS dancers don't use veil work, but for slow segments they may do floor work, standing undulations, or balancing depending on whose step combination format they are using. In Egypt, at the end of her opening Oriental set a star performer will exit for a costume change and come back on wearing a folkloric costume. Her finale will then consist of a folkloric-style dance. This could be assaya (cane dance), shamadan (candelabrum), melaya-lef (dance wearing a melaya), or just a Saidi style dance wearing a galabeya. Or, alternatively, she may put on a thobe (dress) and do raqs al nasha'at (one of the women's dances from the Persian Gulf/Saudi region). In the United States, however, dancers usually don't have the luxury of a costume change into folkloric because it's rare for performance opportunities in the U.S. to involve a full-length dance concert. This baladi dress worn by Morocco is typical of the ones worn by performers in Egyptian nightclubs. It was made by the famous Egyptian costume maker, Madame Abla. For maximum sparkle, it is covered with paillettes attached to short fringes of rocaille beads, with long beaded fringe at the neckline and hip. Photo used with permission. Americans make their entrance with the veil tucked into their costume. Veil wraps vary according to the dancer's individual taste, but many dancers wrap their veils in a way that completely covers the torso, and often the bottom edges of the veil also hide the belt. That way, when the dancer eventually removes her veil, the costume underneath is a bit of a surprise for the audience. It effectively gives two different costume variations in a single dance. Throughout the entire first song, which is generally either fast or medium speed, the dancer keeps her veil on. As the first song winds to a close, the band transitions to a second song which is usually a soft, dreamy rhumba. Typical songs used for the second part might be Misirlou, Bir Demet Yasemen, Cleopatra, or Erev Shel Shoshanim. At the very beginning of the rhumba, the dancer (still fully veiled) might do some soft, graceful movements with her arms, hip sways, undulations, etc. She then transitions from those to removing one side of the veil, often while spinning and using her eyes and movement of her free hand to direct attention away from the hand that's peeling off the veil. She might dance with half the veil thus free and half the veil still tucked in, or she might then proceed to remove the other side--whatever inspires her at the moment. PHOTO CREDIT: Photo taken by John Rickman. For the duration of the slow number, she uses the veil as a primary element of her dance. It might be a frame for a beautiful undulation. It might flow freely as she spins. She might wrap it around her body, then undulate fully wrapped, then unwrap it while dancing. Many American dancers have come up with beautiful innovations on what to do with the veil. As the rhumba draws to a close, the dancer gracefully discards the veil--sometimes by wrapping it around the head of a male audience member like a turban, sometimes just dropping it where it will be out of the way. This veil work generally lasts about 3 minutes altogether, and usually (but not always) the dancer uses the veil the full time, not discarding it until that song ends. Some tribal dancers who follow the Bal Anat path do veil work, and some don't--it's a matter of personal taste. Of those who do opt to do veil work, the dance is usually much the same as an American Restaurant dancer, although some of the movements may be done in a folkloric fashion rather than a "show business" fashion. Tribal dancers doing veil work are less likely than American Restaurant dancers to use flirtatious peek-a-boo moves. Veil work is not part of the American Tribal Style (ATS) of belly dance pioneered by FatChance, because it doesn't fit well with the "proud woman" attitude of ATS, and it also doesn't work well for group improvisation. Egyptian Oriental "Piece of Fabric"
Sometimes Egyptian Oriental dancers enter carrying "a piece of fabric" to music that is very fast and dramatic. While Americans refer to this piece of fabric as a "veil", it's important to note that Egyptians do not link the fabric prop to the hijjab (Muslim attire). Therefore, it's not exactly correct to refer to the prop carried by Egyptian Oriental dancers as a "veil" because that's not how they view it, culturally speaking. Egyptian Oriental dancers usually swirl their piece of fabric around a couple of times with very simple moves during the opening songs, and discard it within 30 to 60 seconds of entering. The veil is not incorporated much into the dance. They then continue their opening fast/medium song doing typical fast/medium moves. Egyptians see the "piece of fabric" sort of veil as a shawl, a garment to wear. From their cultural perspective, American-style "conceal and reveal" veil work looks like stripping. Of course, exceptions have existed. In particular, Samia Gamal, did some beautiful, swirling veil dances. However, such dancers are definitely the minority in Egypt. There is a type of character dance done by Egypt's folk troupes known as melaya lef which uses a shawl-type of garment known as a melaya as a prop. In the melaya lef folkloric dance, the dancer plays the role of a mischievous young woman who flirtatiously plays a "conceal and reveal" game with her wrap. In Egypt, an Oriental dancer might use the melaya lef dance for the folkloric part of her show, but she doesn't do so wearing her Oriental costume. In the U.S., since most Americans doing Egyptian style dances don't have the opportunity to do a costume change after the Oriental set and come back out in folkloric costume, they rarely use the melaya lef in their Oriental performances. American dancers performing Egyptian Oriental style sometimes do an Egyptian-style veil entrance, although some American dancers might swirl the veil around a bit more than what most Egyptians are likely to do.